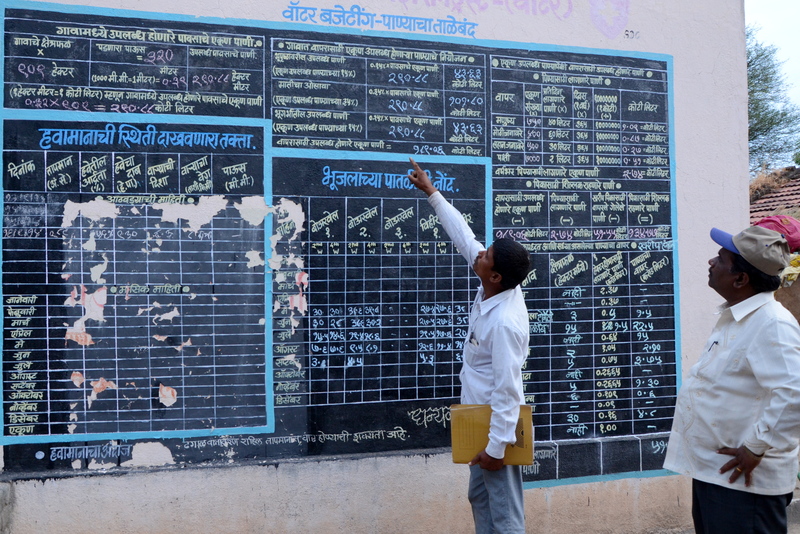 Water budgetting board in Maharastra, India. Credit Tali Hoffman. Recognising the factors that can influence the progress of adaptation actions is key if adaptation to climate change is to move beyond identifying impacts and potential responses. ASSAR has been examining the conditioning factors surrounding adaptation action in four of the world’s semi-arid regions (SARs), with a specific focus on barriers and enablers to the uptake and success of adaptation. In particular, our integrated work streams have highlighted not just the existence of barriers and enablers, but their interacting effect. None of them operate in isolation, and it is their interaction that shapes the overall constraining or enabling conditions for adaptation action. This document summarises this work (overview provided below - see the full text for more details and references). Adaptation involves the implementation of actions that reduce the risks posed by climate change. However, the planning and implementation of adaptation actions are often constrained by barriers – different factors that make it harder to achieve adaptation outcomes. Barriers are most commonly categorised as financial, technological, institutional, informational, or socio-cultural (Antwi-Agyei et al., 2015; Biesbroek et al., 2013; Eisenack et al., 2014; Moser and Ekstrom, 2010). On the other hand, enablers are factors that assist the implementation of adaptation. Enablers can be the factors that are used to overcome barriers, and can require: shifts in thinking, social norms and behaviours; shifts in resource use and land use; as well as adaptive management, and changes to institutions and their governance. To date, however, there has been relatively little focus on the ways in which barriers and enablers intersect, and the associated implications for adaptation processes. Barriers and enablers can emerge, overlap and interact at different scales of time and space to create a complex adaptation challenge (Lehman et al., 2015; Shackleton et al., 2015). The aim of this brief is to use examples from our empirical work in the SARs of India, Namibia, Ethiopia and Mali to illustrate how barriers and enablers interact, and to draw out key considerations for planning how to facilitate an enabling environment for adaptation. Water availability in SARs of India is a critical constraint of livelihoods and key focus on adaptation interventions. Adaptation across the ASSAR research sites were found to focus on infrastructural interventions rather than institutional and behavioural ones. Two main factors acting as barriers or enablers of sustainable adaptation are local water governance, and famer assets and social capital. Governance factors and farmer characteristics interact and mediate the success of adaptation strategies to use and manage water more efficiently and sustainably. Where barriers and enablers interact: Regulatory and policy mechanisms intended to enable adaptation in the water sector need to take account of complex economic, social and cultural barriers that intervene to shape who benefits from water management interventions – especially if they are to avoid the perverse consequence of turning a water-access enabler for some into a water-access barrier for poorer groups. Where barriers and enablers intersect: Support for invasive species management approaches within rangeland populations depends on an interacting web of considerations people make surrounding economic interests, resource access, social relations, and experiences of previous interventions. When designing interventions it is crucial to assess how each intervention functions locally and collectively as positive enablers or negative barriers. Seed regulations in Mali are intended to promote access to high quality seeds and improved agricultural productivity. However, the perceived benefits of these regulations are limited due to farmers getting seeds through traditional seed systems. Governance and regulation issues were found to act as enablers and barriers to effective adaptation through onerous and expensive administrative processes. Furthermore private seed companies limit interactions between seed producers and farmers and increase the costs of certified seeds. In general, although the seed regulation was enacted to facilitate farmers’ access to high-quality seeds, the gap between the seed regulation and the local conditions in which farmers operate hinders the implementation of the regulation, and prevents the majority of farmers from accessing improved seed. Where barriers and enablers intersect: Attempts to enable equitable access to better seeds for farmers are unlikely to succeed unless they recognise the interacting barriers that may be put in place by processes within seed exchange systems. These include those associated with administrative certification procedures and the practices of private intermediaries. Climate-smart agricultural practices that conserve water and soil quality have been suggested to overcome challenges of marginal agricultural production in Namibia. While national government, NGOs, and development agencies have devised strategies to promote climate-smart agriculture, the uptake of these practices have been slow among small-scale subsistence farmers. Two major factors which can enable or constrain climate-smart agriculture in Namibia are information and capacity deficits, and incentives to change practices. Though different organisations are attempting to enable the uptake of more climate-resilient practices, their efforts intersect with wider cultural, social and political barriers that tend to compound one another to give rise to still-stronger challenges. Where barriers and enablers intersect: Initiatives to promote adaptive farming practices must consider carefully how to make interventions attractive, meaningful, feasible and productive for economically and politically marginalised groups, if they are to counteract powerful compounding barriers and turn them into a potential set of mutually reinforcing enablers. Though it is not always explicitly acknowledged, it is self-evident that different factors that act as barriers and enablers to adaptation intersect and interact to shape adaptation outcomes. The web of intersection means that, just as different forms of enablers combine to increase the chances of progress, so multiple interacting barriers can be mutually reinforcing to severely constrain progress. Equally, different factors can, in effect, counteract one another, with some acting to strengthen while others undermine the uptake and success of adaptation actions. Predicting precisely how this complex web of interaction will work in practice is difficult, of course, but during the design of an intervention it should be possible to identify what are likely to be critical combinations of factors and how they may work together to hinder or support adaptation. This is particularly important if we are to make adaptation work in practice for the poorer and/or least powerful groups in society. In some instances this process may also identify cases in which a deeper (step-change) transformation of policy and practice may be required in order to take adaptation forward in a sustained, widespread and equitable way. Common intersecting barriers cover factors operating at multiple scales, and include institutional commitment, administrative processes, political interests, community-external relations, information provision, financial assets, social networks, and cultural norms. Systemic and interacting barriers to adaptation – such as weak governmental regulation, lack of trust in external organisations, or poor commitment to making information sources accessible – need to be recognised and targeted through longer-term interventions that focus on enabling behavioural change and collaboration among all stakeholders. Barriers and enablers are socially differentiated in their effects, working differently for different population groups, as seen especially in the example here from Ethiopia. In some cases there can be a ‘reversal effect’, in that an enabler for some people can act as a barrier for others. We see this in the regulatory mechanisms that promote access to seed and water resources in Mali and India, but – given their costs – do so only for wealthier groups. For the poor, the chances to invest in an adaptive action are highly likely to be constrained by risk aversion, especially in the absence of strong enabling mechanisms. The cases in this brief provide evidence of ‘stuckness’, when barriers coincide to keep certain groups marginal from adaptation actions, as exemplified in the case from Namibia. But barriers and enablers themselves are not static, and can shift their configurations within the web of interactions. It is also critical to recognise that an enabler in the current period can generate a barrier in the future. There may be enablers that promote specific ‘adaptations’ (such as groundwater extraction), that can themselves constitute barriers to wider forms of adaptation or adaptive capacity-building (such as progress toward more sustainable water management). This brings a temporal dimension to intersecting barriers and enablers, closely allied with the concept of maladaptation. We need instead to ensure that the design of adaptation options identifies ‘virtuous circles’. These are positive and mutually reinforcing sequences of intervention that provide ‘routes of escape’ where several enablers combine to facilitate sustainable change, especially for previously marginalised or disadvantaged groups. For example, local-level sustainable groundwater management is being enabled in Maharashtra by a mix of behavioural change, available funding, and local capacity strengthening. Participatory processes that attempt to uncover and solve seemingly intractable systemic barriers are one key route for action that aid the transition from hindering conditions to enabling conditions. Within ASSAR we have used Transformative Scenario Planning and Vulnerability and Risk Assessment as ways of bringing people together to address intersecting barriers and enablers.